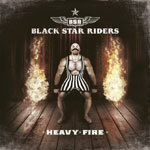 Black Star Riders' third installment, Heavy Fire, slightly differs from its 2 predecessors, All Hell Breaks Loose and The Killer Instinct. Even if it without an ounce of doubt has its roots firmly anchored in classic Thin Lizzy music, I think it takes a tiny step away and broadens the band's perspective. I really can't tell you what they do to make this small progress perceptible, but it's just what I am able to distinguish when I listen to the album. Pretty much every track is at a high capacity level and regarding song quality the record is extremely even. Nevertheless I kind of miss the finest songs that are carrying that little bit extra touch. The album is strong all right, so don't get me wrong, but in some way they don't have the ability to bring forth the last and crucial piece of the puzzle to execute to a hundred percent and blast the songs into true masterpieces. They surely come close pretty often, yet when it's right about to reach sky-high, it sort of just stays at being good and things just move on steadily instead. The boys in BSR have a knack for putting together the old vibe with a modern sound without making it sound constrained or contrived and it's something that they willingly capitalize on. Ricky Warwick's vocals are convincing and his tone of voice is a good match to this type of music. His voice might not be the most brilliant one, technically speaking, but he's doing a fine job indeed when he sometimes impersonates the Phil Lynott vocal style and his performance carries an emotional effect that is able to bring a profound perspective to the whole outcome too. Of course there are people who still find this outfit to be nothing but an insult to Thin Lizzy and particularly Phil Lynott himself, but personally I think that the BSR boys administer his legacy with some dignity and respect because of the fine quality of their records. It would have been a totally different story if the band was put together by a bunch of untalented hacks who weren't able to come out with a valid form of music in the Lizzy vein, but since that's not the case here, I encourage people who haven't passed the critical point of disliking this band to finally give it a shot and find out what they're about really.